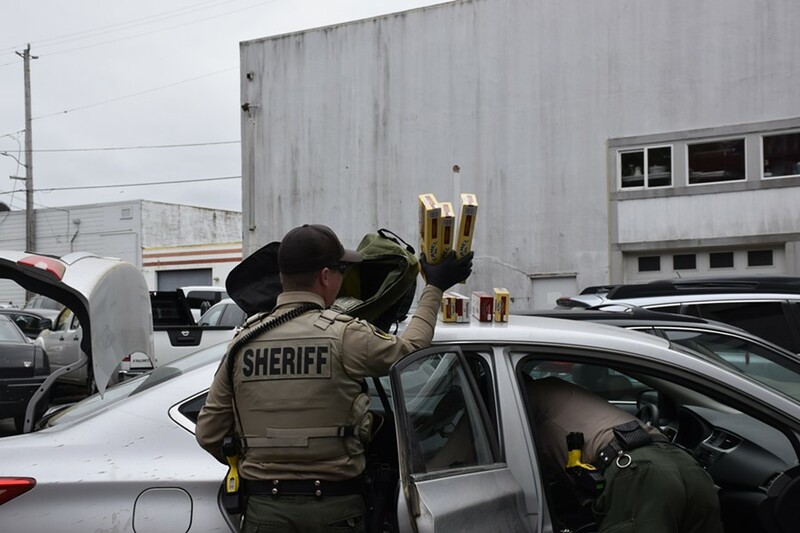 A deputy finds the allegedly pilfered smokes. The Honeydew Store was burglarized last night but it didn’t take long for store owner Bob Shinn to crack the case. The store’s manager arrived this morning to find the door pried open, the cash boxes gone and several cartons of cigarettes missing. Shinn said he checked the store’s surveillance tapes to find two people had broken into the store at about 7:30 p.m. yesterday. The footage included some good images of their faces and the vehicle they fled the scene in. Shinn said he immediately knew the first place he and his wife should look for the burglars this morning. “Anytime someone like that has a score they go straight to the casino,” he said. Bob Shinn speaks with deputies at the scene of the traffic stop and subsequent arrests. So the pair drove up to Bear River Casino and circled the parking lot until they saw the suspect vehicle — a silver sedan. When the suspects — a young couple — left the casino and got in their car, the Shinns tailed them and the couple never suspected a thing. “We put the sneak on them — we’re from Honeydew,” Shinn said with a smile. While tailing the car, the Shinns called the sheriff’s office, which dispatched several deputies. 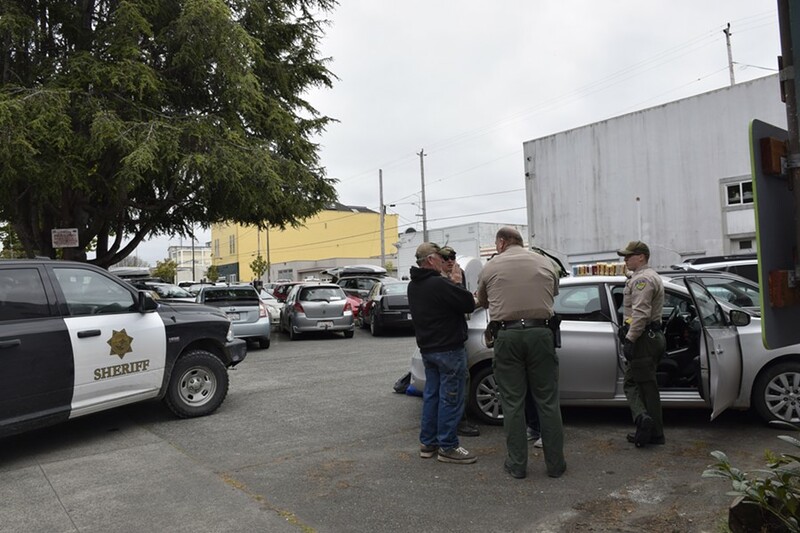 When the sedan rolled into Old Town Eureka, the deputies initiated a traffic stop, with a couple of Eureka Police Department patrol cars providing backup, and took the couple into custody. 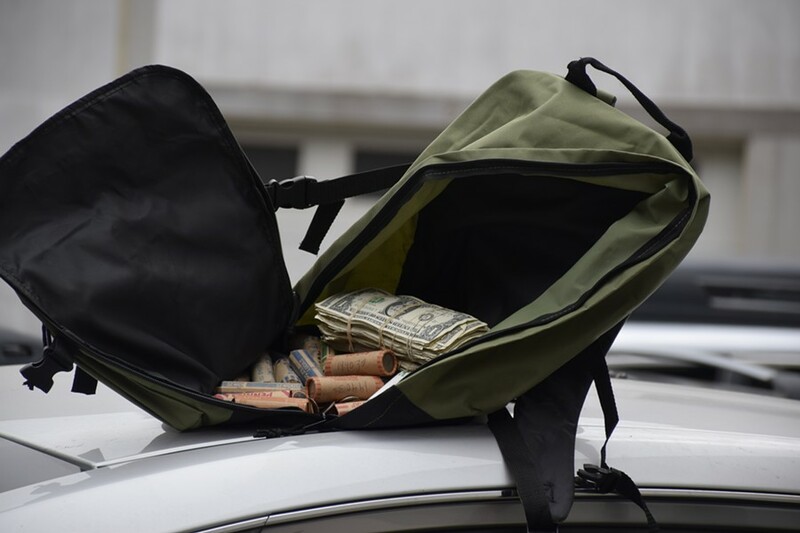 Inside the sedan, they found a backpack with a stack of cash in it and a bunch of rolls of coins, about a dozen cartoons of cigarettes and a couple cases of soda, all of which the Shinns said came from their store. A backpack full of cash and coins pulled from the suspect vehicle.